A dental bridge is used to fill a gap caused by missing teeth. It actually ‘bridges’ the gap between teeth to fill in the space. 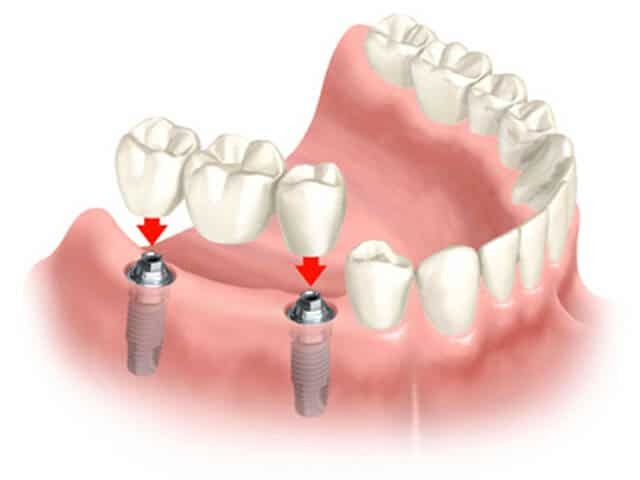 A dental bridge is mounted to either natural teeth or dental implants. A dental bridge is some false teeth that are glued in permanently to fill in spaces. Gaps in teeth are filled by the bridge after it is glued in place. It creates a natural looking smile and gives strong teeth to chew on. Dental bridges can look fantastic and often last a long time. They are made typically out of ceramics (porcelain) with or without a metal layer underneath. Dental bridges are custom made to match your particular tooth or implants. They are glued in using strong cement. What types of dental bridge are there? Many things will change the cost of a dental bridge. Like all dental work find a quality local dentist you trust and organise for a quote before any work.